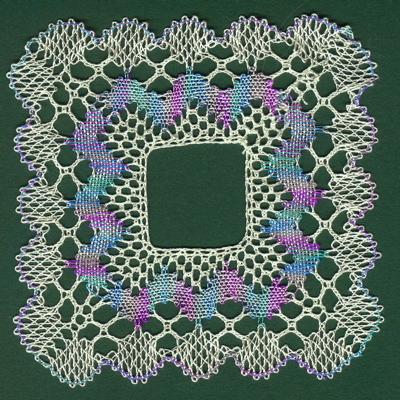 Variegated threads can be used for bobbin lace in all the same ways that solid colour threads can be used, ie as workers, passives or gimps, but the effects are more difficult to predict; sometimes they look very effective and sometimes the result is disappointing. There are no hard and fast rules about which colours to use; it is very much a personal choice but I think that the more subtle colour schemes are generally more pleasing than brighter and sometimes garish colours. I also think that a variegated thread often looks better mixed with a light toned plain thread of a similar hue to (one of) the colours in the varigated thread rather than with white which can dull the colours in the contrast thread. 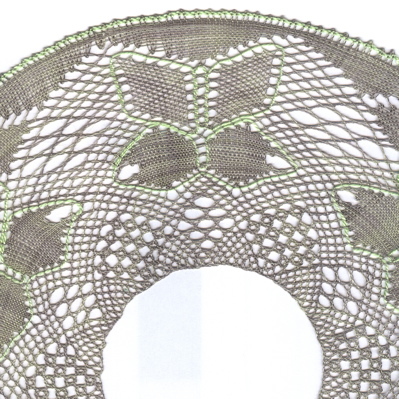 Different threads vary a great deal in the length between each colour change and that makes a big difference to the appearance of the finished lace. 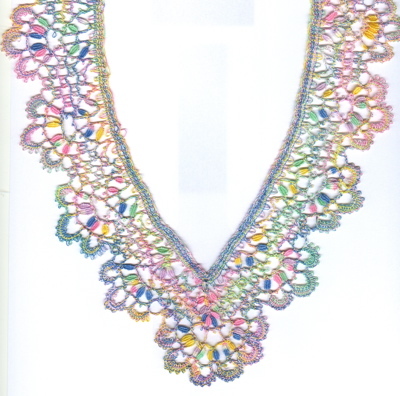 Threads designed for crochet or tatting tend to have long repeats; 25-30 cm whilst those intended for embroidery have very short repeats of 2-3 cm. 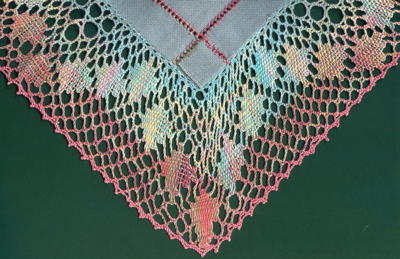 Hand dyed thread, which is usually dyed and sold in skeins, is very variable and often the more colours used the shorter the repeats will be. I have measured the repeat length of the factory dyed threads in my collection. 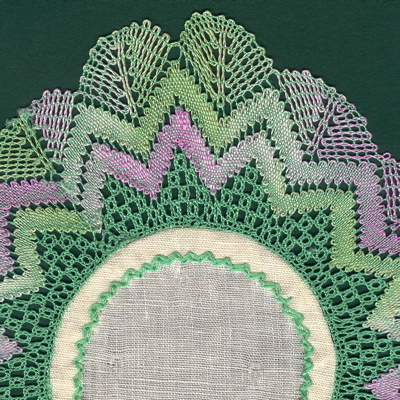 Torchon mat, (computer stretched design) with green passives and lilac/green DMC Special Dentelles workers in trail and fans. 30cm colour change makes a long repeat of each colour. Small torchon square (2mmgrid) worked with pale green passives and Superior Threads Rainbows for the workers in the trail. The 3mm colour change meant very small repeats of each colour. The same thread was wound double for edge passive pair. 3cm colour change. Cream linen mat with single strand of Caron Watercolours used for some of the passives. The colours here are not strong enough and the design is rather open as the cream linen was not really thick enough for the pattern. Single strands of Caron Watercolours again, this time in three stripes; blue/cream, cream/yellow and pink/cream. The cloth stitch blocks ensured that bobbins from one stripe did not stray into the adjascent stripe. Another example of working stripes of varigated threads on a logarithmic pattern; aqua/green, green/blue, green/brown, brown/ochre, brown/orange and red/orange. 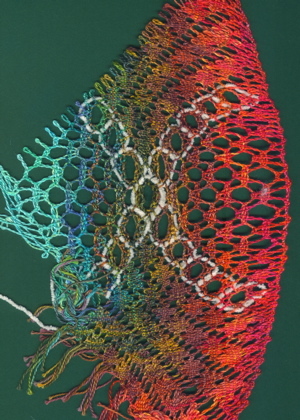 The colours worked well but the sample was abandonned because the thread (Caron Watercolours) was too thick for the grid in places. One of the samples worked before making my handbag Knitting yarn in red/brown, brown/blue and blue/green and cream linen. Just mix of CTCT p CTCT and CT p CT. The bag only has CTCT p CTCT where the thick threads meet, all the rest is CT pCT. A piece of beds-Maltese worked in DMC Special Dentelles which was given to me. 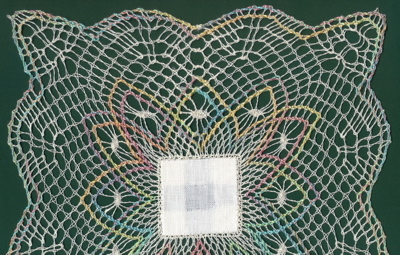 Personally I think that the varigated thread used throughout looks messy, but in a different design where the same two pairs work rows of petals the blocks of colour from the variegated thread could look very effective. Apart from the gimps this piece is worked entirely with a variegated thread, Superior Threads Perfect Quilter, in light, medium and dark tones of ecru. The lightest colour has a slight green tinge which is why I chose green Perle 5 for the gimp and the outside passive pair.